The 2011 Association Autumn visit to Belgium will be from Friday 7 October to Monday 10 October with three nights in Ypres (Ieper) This is an organised visit departing London by coach on the Friday morning with return to London late Monday afternoon. Channel crossing will use the Eurotunnel service. Trip includes travel from pick-up point (Grosvenor Hotel, Buckingham Palace Road, SW1) to West Flanders, Belgium and return to drop-off point (London Victoria), 3 nights hotel accommodation on Bed and Breakfast Basis, lunch on Saturday in Ieper (Ypres). This year the cost of the trip will be £260 per person including the IMOS lunch but excluding the lunch on Sunday and all meals not specifically mentioned. We strongly advise intending participants to take out suitable personal travel insurance. Planned events are as follows. Saturday 8 October (Alternative if not participating in the IMOS Lunch) if you wish to join this group please use our contact us form. Sunday 9 October morning a guided visit to battlefield sites Hill 63 taken by 2/Leinsters + Hampshire Regiment on the 4th September 1918. This was a key episode in the breakout from the Salient that paved the way for the capture of Ledegem a month later. This will be followed by a visit to Ploegsteert Memorial to the Missing to pay our respects to the Leinster missing remembered there - including those from the action at Premesques in 1914. and Ploegsteert. Sunday 9 October afternoon reception and lunch at Ledegem Community Centre followed mid afternoon by a wreath laying at the 40/10 Memorial and a thanksgiving service in St Pieter's Church. After the thanksgiving service there will be a social with beverages. Monday 10 October morning Visit the "Island of Ireland Peace Park", afternoon return to UK. Members often seek advice about what attire to take. Autumn weather in Belgium is not too dissimilar to weather in the UK so be prepared for a rain shower. Days can be warm though evenings are often cooler than experienced in UK. The Last Post ceremony is held at 8pm so expect a cool temperature. When participating in some events we have prepared some further guidance. Saturdays IMOS lunch (included in the trip price of £260) is organised by The Inter-Allied Military Organisation (Sphinx) that commemorates a WW2 movement created during the occupation of Belgium by Germany. Each year veterans of WW2 and their descendents, plus serving members of the Belgian Defence Forces, meet to commemorate events passed and present. The formal side is kept to an acceptable level and after a splendid multi-course lunch, the afternoon can be spent socialising in a relaxed atmosphere that includes the opportunity to make use of the dance floor! Gentlemen attire is lounge suit or regimental blazer and flannels; medals may be worn. Ladies attire should be smart casual. Sunday's reception and thanksgiving service in Ledegem is organised by Heemkring Liedengehem and the the cost of Sunday lunch is not included in the price of the trip and requires the purchase of an additional Sunday lunch ticket. The price of the lunch includes wine or other drinks upon arrival followed by a "Buffet à Volonté" full of local specialities including a dessert concluding with a choice of coffee or tea. "Buffet à Volonté" means eat as much food and beverage as you wish, all beverages throughout the reception and meal are included in the price of the Sunday lunch ticket. Beverage includes beer, wine, alcohol-free beer, soft drinks, coffee and tea. This year's events in Ledegem will not include a formal parade, the emphasis being that of a more relaxed event. Attire can therefore by 'smart casual' though members, if they wish, can wear regimental blazer and flannels; medals may be worn according to personal choice. Want to make your own way? If you wish to attend the IMOS lunch and/or the Ledegem reception/lunch please contact Ian Lowe on 01978-854419 to purchase your tickets. Hint: If staying at The Hotel Daiseldale mention the Association and that you are attending the event in Ledegem. Guidance on Dress Code: The emphasis during in the trip is to maintain a relaxed and informal atmosphere though there are occasions, such as the IMOS lunch and the Ledegem reception when unconditional casual dress would be inappropriate. On the other hand a visit to a Commonwealth War Grave Cemetery or the site of former battlefield often involves walking on grass. Members therefore need to strike a balance to suit the event being attended. If you are travelling on the Association coach then alternative attire (footwear/jacket etc.) can be carried. Last Post at Menin Gate, Friday If taking part in the Association parade and wreath laying Regimental Blazers Caubeens and Medal entitlement including tribute medals may be worn, other wise as a spectator casual attire. IMOS Lunch Saturday Gentlemen attire is lounge suit or regimental blazer and flannels; medals may be worn. Ladies attire should be smart casual. Free evenings in Ieper (Ypres) Saturday and Sunday casual attire. 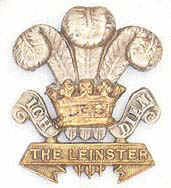 Leinster Association Blazers Caubeens and Medal entitlement including tribute medals may be worn when attending formal commemorations and wreath laying ceremonies. Read "Why the Leinsters commemorate the liberation of Ledegem?"